This is a non-official site, just to promote Chile as country and its culture. To the east the Andes and west Pacific Ocean. Between them there are mountains, valleys, lakes, volcanoes and a host of other major geographic features. It has almost every climate in the world. On its northern side and for about 1,500 kms. from the border with Peru to the south, there is one of the driest deserts on earth. Here are the highest peaks of the Andes, whose peaks reach 6,893 meters to the. Extensive plateaux and valleys downstream end on the coast and cliffs overlooking the sea. In the southern sector of the North Chico begin to appear the first signs of vegetation due to the sporadic rains that fall three to four times a year. This allows one of the clearest skies to make astronomy, exist in the major telescopes worldwide. In the area start to appear called transverse valleys where grapes are grown for the production of Pisco, Chile’s traditional liquor. Further south Valparaiso port activity center where the National Congress, and Vina del Mar is known for its tourism. 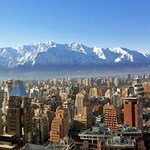 In Santiago, the capital of Chile, we have the largest population mass in the country. This city also has the main international airport that receives almost all international flights. Further south we have a Mediterranean climate that allows agriculture, an activity that characterizes the countryside south of Santiago. About 500 kms. and the flora is most abundant, resulting in the greenery of the landscape and the appearance of lakes and rivers. Puerto Montt in the south the land is totally bankrupt and changed appearance. Thousands of islands, channels, fjords, steep mountains, immense glaciers and rushing rivers with virgin forests reaching the sea, form a landscape of great beauty.